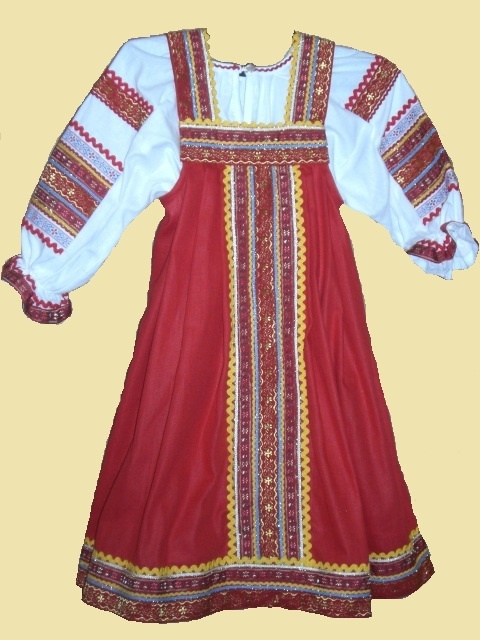 One of the simplest types of sewing children's clothes is a Russian sarafan. At the same time, any girl will look very impressive and Patriotic, it can be put on stage on new year's eve concert or just walking on the street. 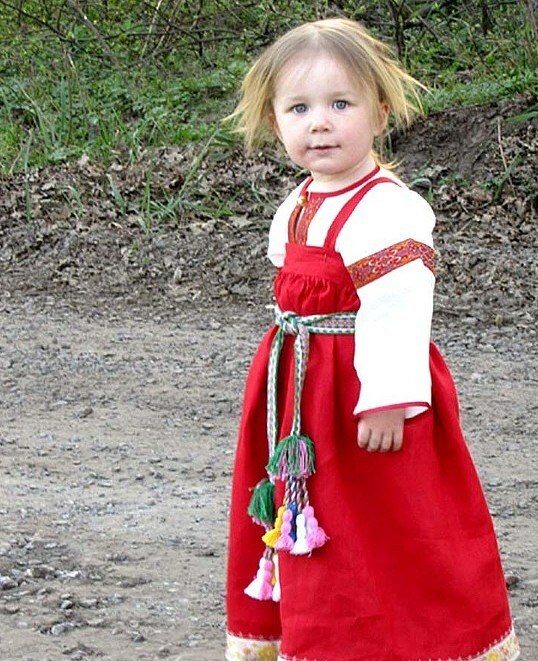 Try to sew a sundress for Russian girls, and you will see that it is a versatile dress for all occasions. Select the material for the outfit; this is a very important stage. The traditional color for a sundressand red. In any case, pay attention to the quality and brightness of fabrics; Russian sundress should be very bright, preferably plain or with a subtle ornamental print. If you already have a shirt for a sundressand pick up cloth under it (for example, shirts with blue trim, you can choose blue or light blue color). Make pattern sundress. To do this, measure the growth girls from armpit to floor - this is the length of the pinafore (adult outfit is usually sewn in floor, but for a child lift up the hem a few inches). Using a measuring tape find the circumference of the chest, increase it to 2 or 2.5 times, this will be the width of the skirt of the sundress. If you have the opportunity and desire, I raskleit sundress down; to do it two or four parts, extending to the hem. Cutting the rest of the parts. Draw a strip with a length matching the circumference of the chest (plus 6cm each side) and a width of 10-12 cm - it will be Flirty. Take the strap width of about 8-10 cm and a length of not less than 40 cm (the excess then cut off the fitting). Sew the side seams, if you decide to sew the sundress in the Russian style of several parts, and frayed edges (no serger, sew seam "zigzag"). One seam position the back and sew it to the end, leaving a small release for the clasp. Fold the edges of the zipper and sew 1 cm from the edge in the form of an inverted P.
On top of the skirt to make stitching large stitches and pull it so that its length was about 4 cm less than the length of the yoke, to distribute the gathers evenly. Sew the yoke by aligning the center of the resulting joint should be near the clasp. Sew overcasting along the edge of the yoke with the upper cut of the skirt. Fold the strip in the shoulder twice to sew the ends from the inside. Then turn them, fold the free side of the yoke, and manually baste, and then sew on the machine (if you are not sure that they will be able to sew straight, sew the wrong side of the yoke concealed stitches). Sewn and line the hem of the sundress. Sew a button on the yoke and make a loop on the other side. Stitch the straps to the underside of the length and remove. Sew to the front of the sundressand that the inside edge was hidden. Wear a sundress for a girl and try on the length of the straps, the extra cut. Sew the straps in the back so they do not fall off the shoulders, it is better to sew them closer to the center (to the clasp). Chisel sundress hem at the top, straps, decorative ruffles, embroidery, fringe, ribbons in the Russian style. In written sources the history of dress dates back at least to the XIV century. The so-called womens dresses, which, contrary to common belief, there were as sleeveless and with sleeves. The word comes to us, oddly enough, from the Persian language ("sеrāрā" – "honorary.") Now skorts still in fashion, but buy Russian national sundress will not be so simple. But if you put some effort, it can be done by hand. You will need a sewing machine, pattern, fabric, thread, needles, pins and all kinds of decorations – ribbons, beads, lace. 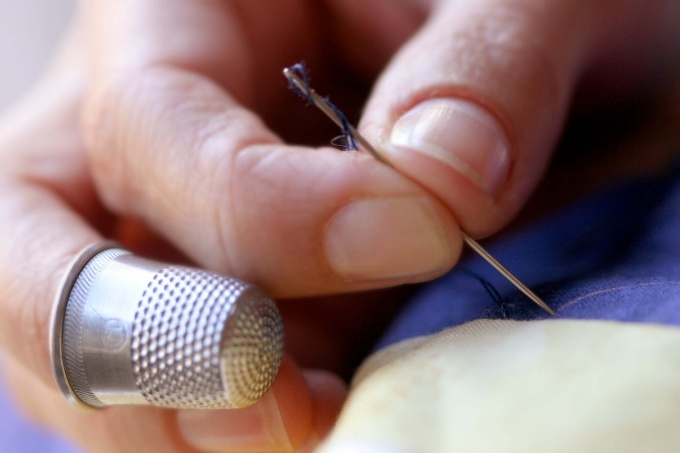 If you don't have any experience in sewing, it is best to find ready patterns. On the Internet there are many sites devoted to needlework in General, and Russian folk clothes in particular. And sold in shops specialized literature. Decide what kind of sundress you want to sew. Whether it's the simple garb, where once the peasant went to cut hay, or the suit that is highly popular in XVII-XVIII centuries. Keep in mind that in addition to the sundress you may also have to sew the shirt and apron. If you are looking for the simplest way, it is best to do a "straight" dress, consisting of two straight lengths of fabric and wide straps. Now you need to choose a fabric (preferably natural, not synthetic, as it and it is easier to work), take measurements with the person who will this dress to wear and the pattern to cut out future parts of the costume. Fabrics can colored and bright silk and cotton, thin and thick to you. Hem all the edges and connect the parts of a dress. Baste them and then begin to stitch the fragments of the future of the costume by hand or on the sewing machine. After connecting all the parts necessary to decorate sundress. Embroidery, beads, ribbons, bright scraps of fabric, lace will give the sundress festive and elegant look. Ready sundress can be belted with a sash. If you sewed a sleeveless sundress, under it, you will have to wear a shirt. The head can be left uncovered or, if you have no desire to make headdress, make from remnants of fabric bandage or a handkerchief. In summer, the village girls went barefoot or in sandals, and wealthy peasant women and townswomen could afford even the expensive and beautifully decorated boots. Russian sarafan - not only clothing, which relates to national history. In some modified form, we still wear these tunics in summer and winter. Simple cut and the ability to use different colors and texture of the materials make these versatile skorts and clothes for the office and for the beach. And we'll show you how to sew their progenitor – Russian sundress. Measure the width of the back and chest. 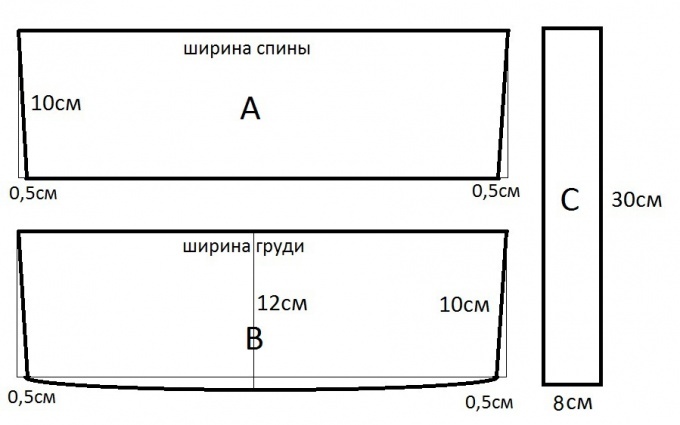 On a sheet of paper patterns to hold your personalized pattern based on these dimensions. From colored fabric cut two parts A, b and C. It will be the yoke and straps of your future dress. From the remnants of colored cloth cut into strips with a width of 7 cm, they will go to the finish of the dress. Sew the side of the yoke, braid the top portion. On the front panels sew the finishing strip of colored fabric. Sew it together with the braid that lay along the seam. Sew the side parts of the front and rear cloth. Hem tape handle finishing of colored fabrics with laid along the seam tape. Athlete hem. The upper part of the panels stitch large stitch and assemble in kulisku" width the bottom of the yoke. Sew the yoke and lower part of dress. Smooth and treat all the seams from the inside. Webbing fold in half, ostracise them, paving the braid on the edge. Iron straps and adjust their location and length, wearing a sundress. Pristrochite them to the yoke.